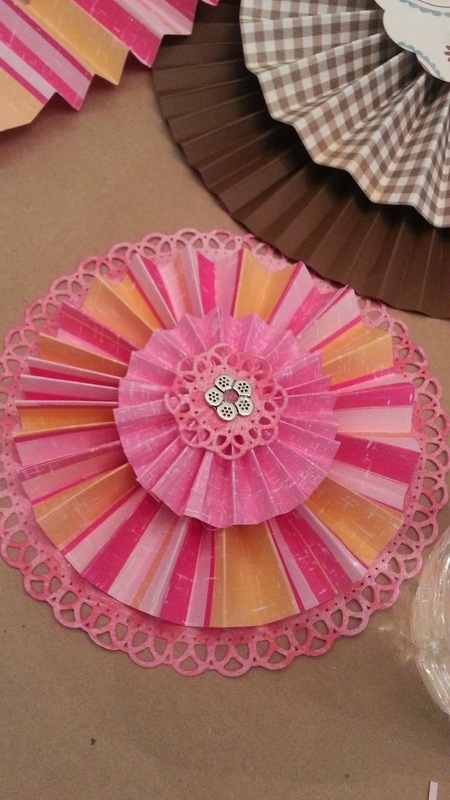 March is National Craft Month, so I thought it would be really fun to spend some time at Melrose Vintage in Phoenix teaching a few friends how to create vintage style paper rosettes. 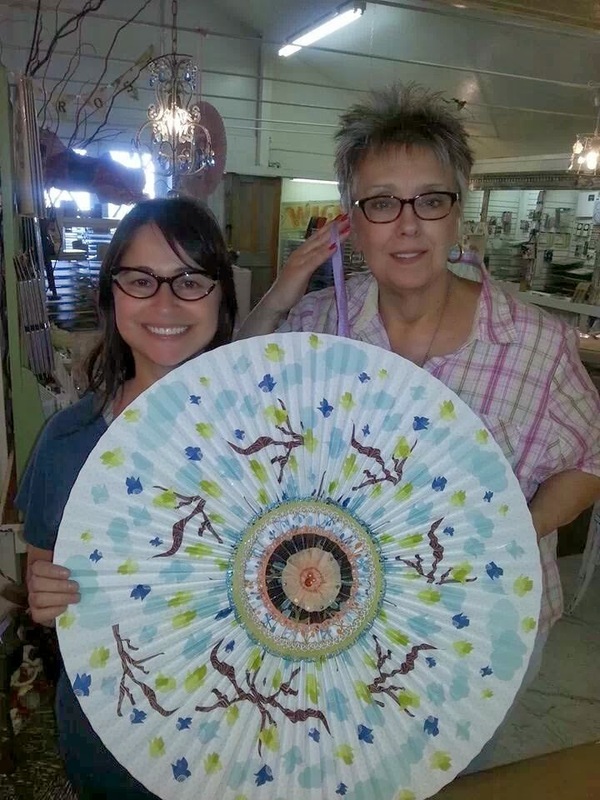 My friend, Giussepina "Josie" Cirincione and I arranged some time with the store, and set out to have a rosette class. 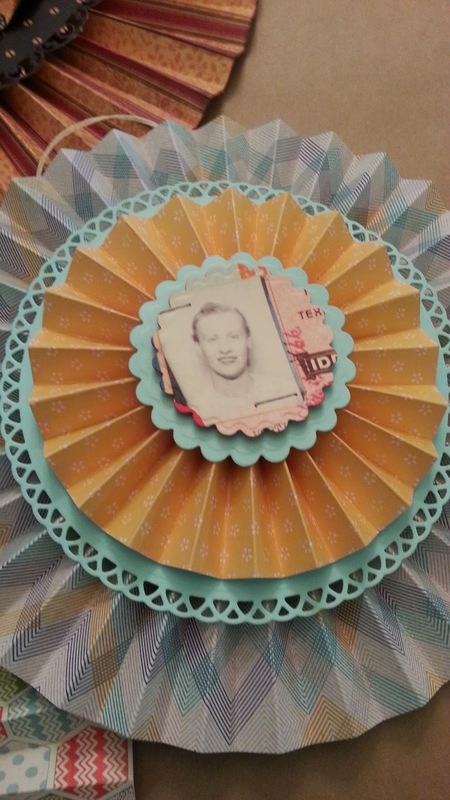 Teaching vintage style paper rosettes fits right in at Melrose Vintage...in fact the owners Diane and Wendy Christensen make beautiful paper rosettes to use as decor in vignettes at the shop. 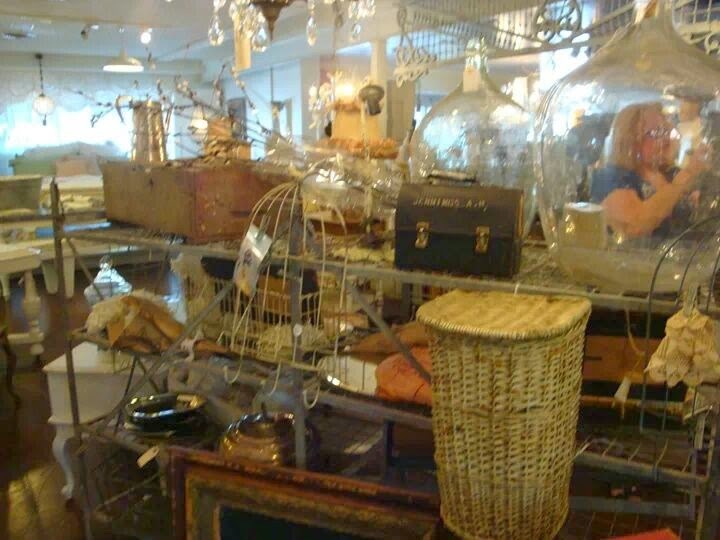 And, Melrose Vintage is one of the most amazing places I've ever seen, It's a real feast for the eyes. 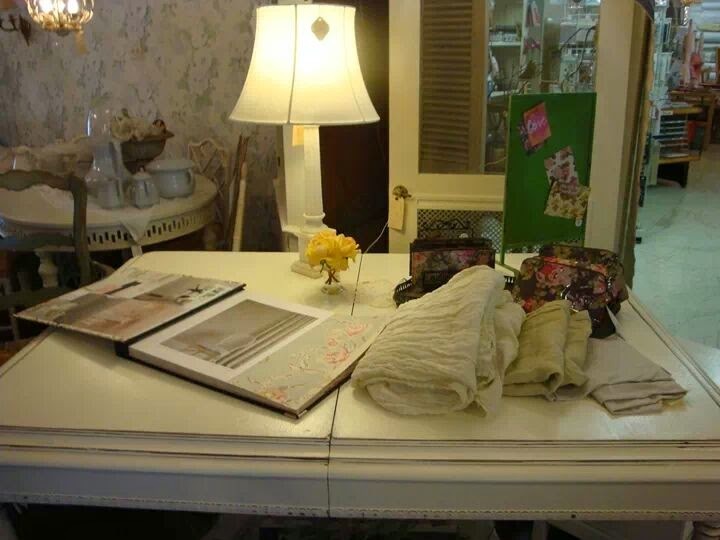 They specialize in antique furnishings, luxurious fabrics and bedding, jewelry and amazing paper crafting. Their shop is so beautiful, I just want to share a few photos to let you see how amazing it really is. 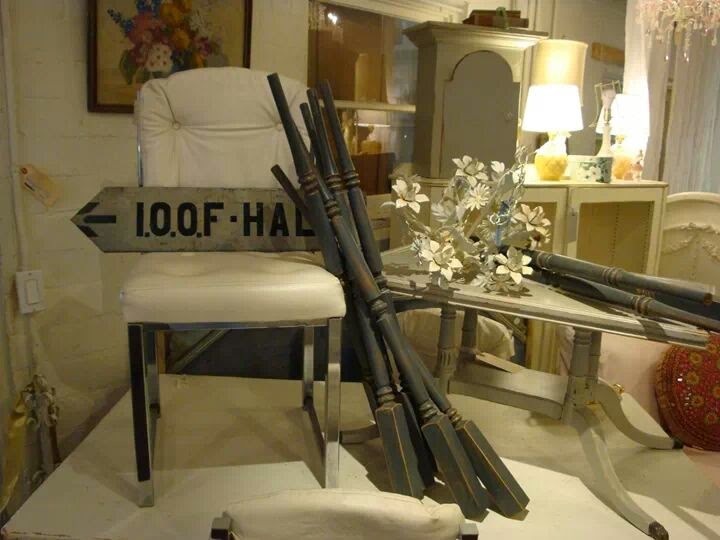 I have never really experienced anything like Melrose Vintage before, and should you plan a trip to Phoenix, it should be on your "to do" list if you like beautiful things, vintage furnishings, or paper crafting. 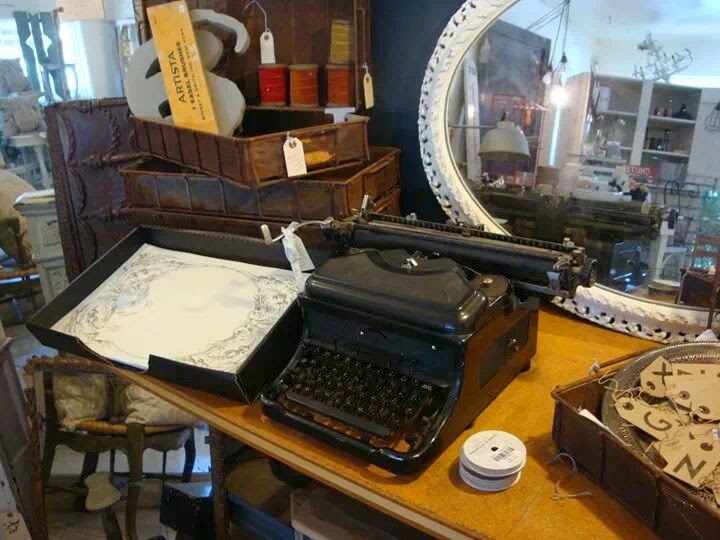 Melrose Vintage is a beautiful experience. 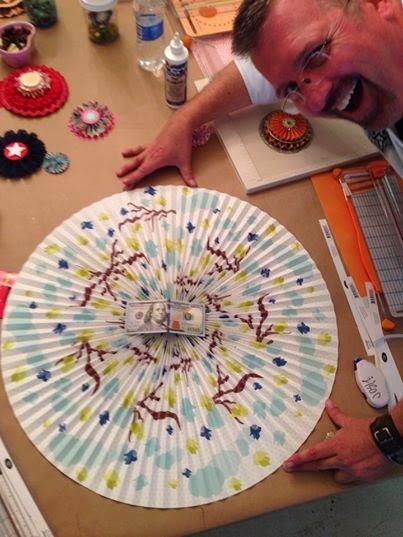 Our plan for this class was simple: to demystify some of the techniques used to make beautiful rosettes. 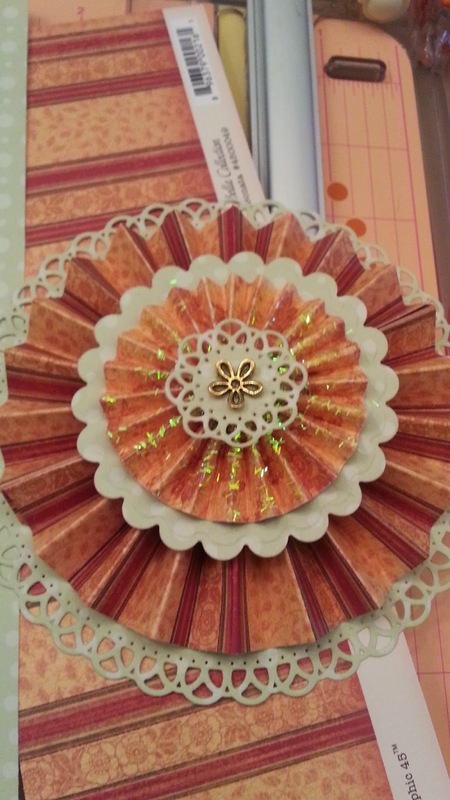 All of the techniques used are really simple, accordion folding, pleating, assembling, and the skillful mixing and matching of colors and patterns to create rosettes that really pop! And it was "open" workshop...once some of the techniques were explained and we'd created a rosette or two, everyone was allowed to create as many rosettes as they wanted with the paper and supplies we'd provided. Our projects turned out beautifully! We had a group of "makers" who really liked trying cool color combinations and cool patterns! 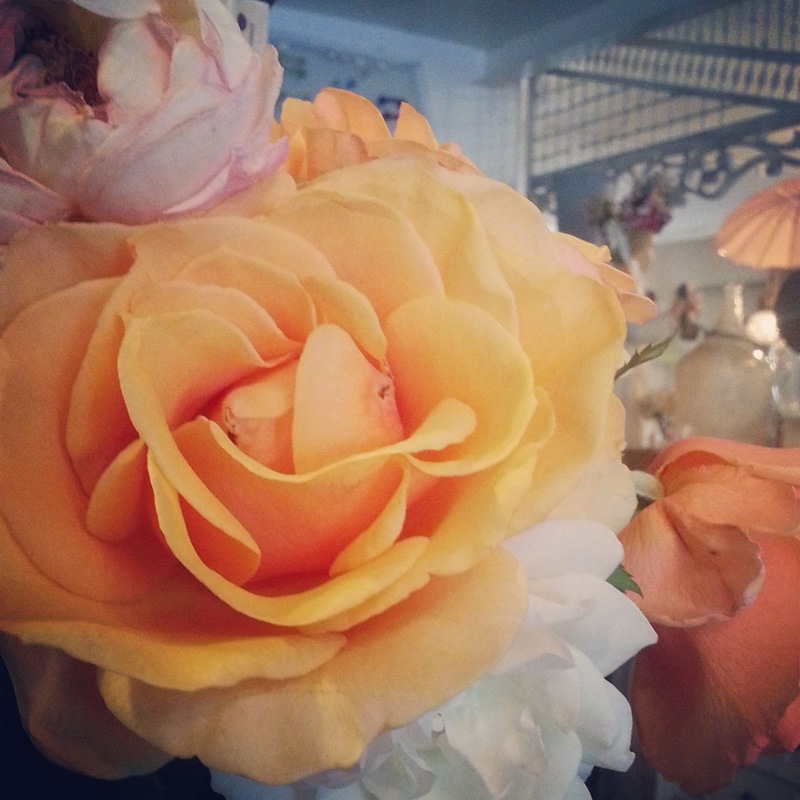 Each rosette was stunningly beautiful and expressed the personal style of each student. All it really takes is a little time and thought about how to mix color and pattern for beautiful results. 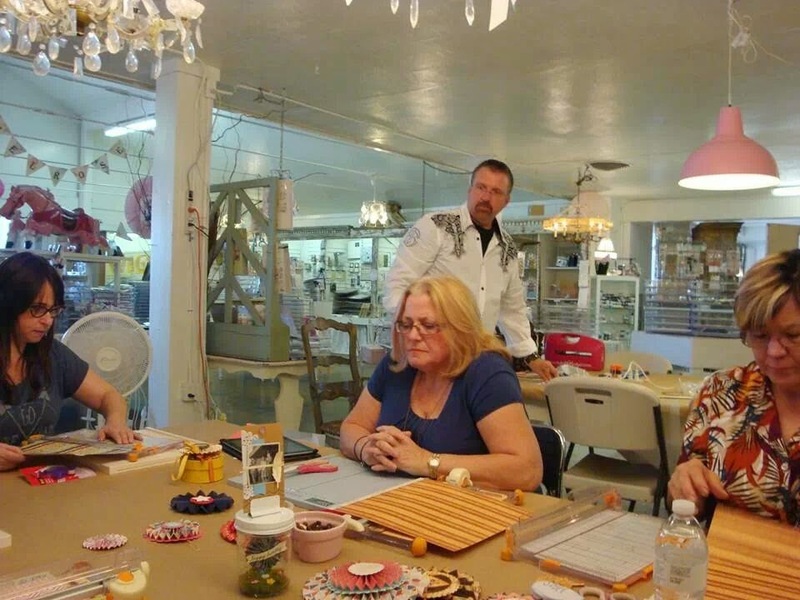 We were really lucky to have a great group, who really wanted to learn and to try new techniques. 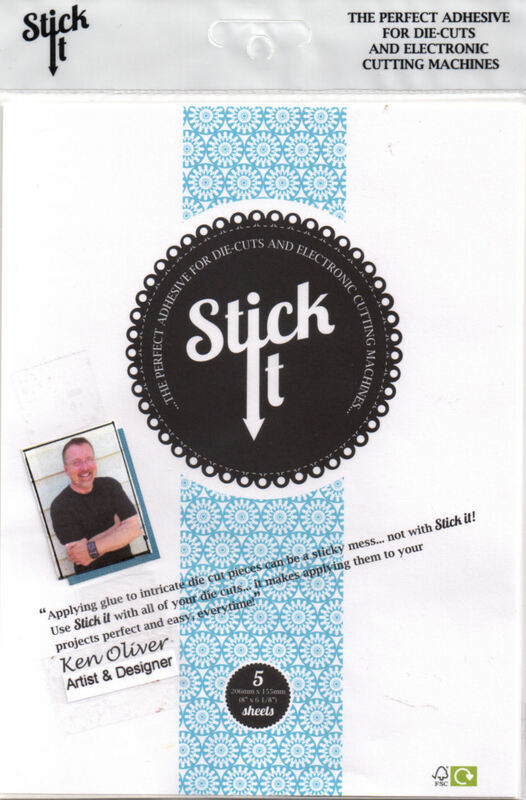 Sue owns a mixed media store in Spain and Diane is a well-known artist/teacher in the US. it was great to have them join us. During the class, they asked the question, "how big can you make these?" 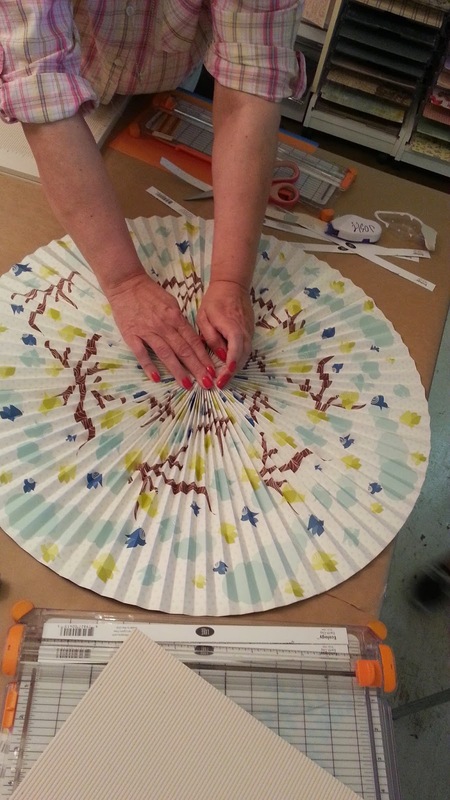 Of course, no challenge goes unheeded among crafters, so Giuseppina "Josie" set out to make a super-sized rosette. 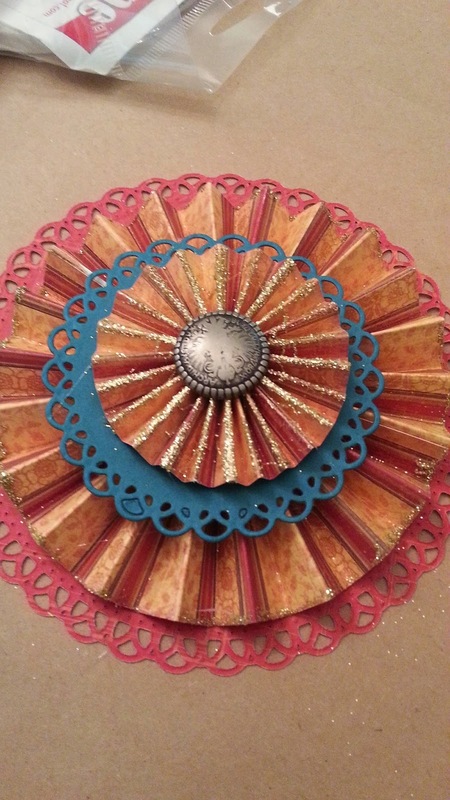 By using six sheets of 12"x 12" scrapbook paper, she was able to create a rosette that was two feet across...it looked really cool! 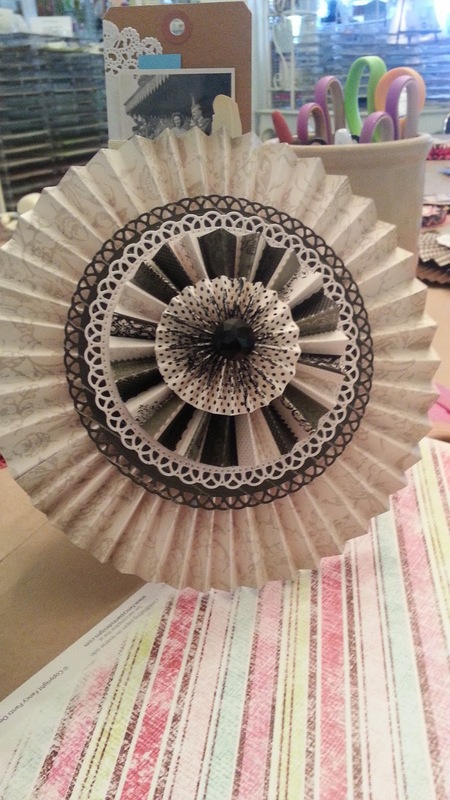 She stood up to the challenge and created one amazingly big paper rosette! When Josie, Sue and Diane had finished creating the gigantic rosette, Sue and Diane decided to do something really special with it. It seems one of their life-long friends, who lives in Phoenix suffers from Alzheimer's disease and recently moved into an assisted living facility. 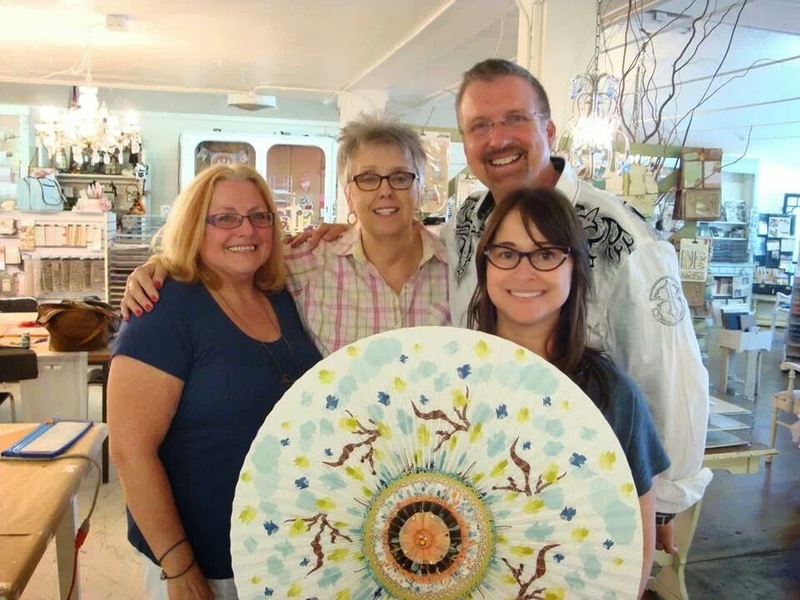 They were going to take the rosette over to her as a gift to hang in her new home. To me it was really touching. I love it when the things we make can make other people happy and I know this really big rosette will bring their friend some happiness every time she sees it. 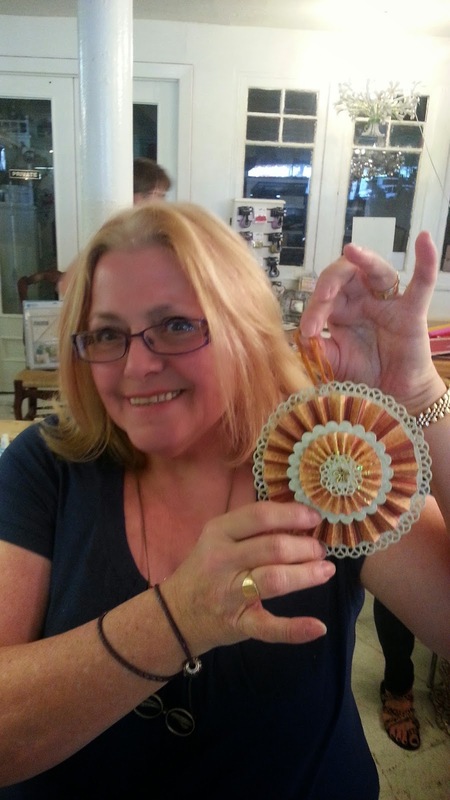 We really had a nice time, and made some wonderful memories...and it seems that "Josie" and I will be teaching Vintage Paper Rosettes at Melrose Vintage again soon...we got a number of calls from others who would like to learn how to create rosettes. 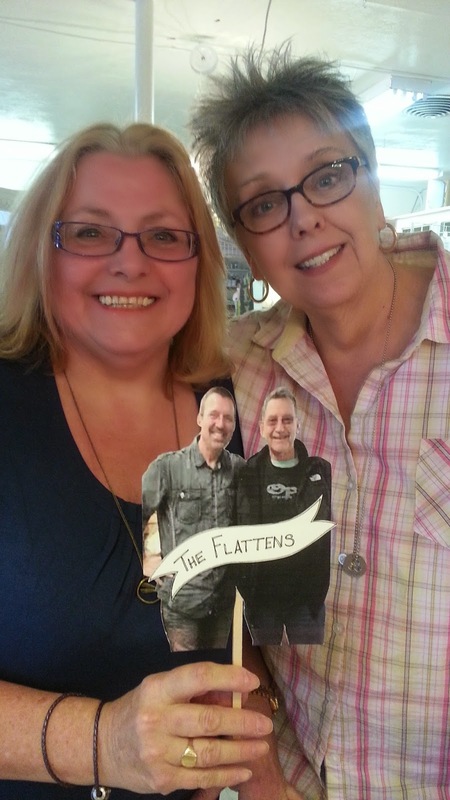 It's a real pleasure getting to share our love of crafting with others. We're looking forward to teaching this class again soon. Thank you for stopping by...make sure to create something beautiful today! It was our pleasure to be able to attend a class taught by you and Josie. It couldn't have turned into a better event than we had already planned. The rosettes are now hanging in Marilyn's room and hopefully they bring her a little bit of joy into to her world. We can only hope. Without you two it would not have happened at all. We thank you from the bottom of our hearts.